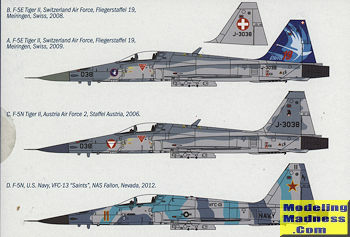 The Swiss Air Force operates a total of 22 F-5E and 4 F-5F aircraft, from a peak of 98 and 12 in 1981. They were chosen chiefly because of their excellent performance, suitability for the unique Swiss Air Force mission, and their relatively low maintenance cost per flight hour. It had been expected these aircraft would be replaced by the Saab JAS 39 Gripen, but in a May 2014 referendum the Swiss public decided against the Gripen purchase. For the foreseeable future Switzerland will continue to operate its F-5 fleet until 2016. There are still plans by the Swiss Air Force and in the Swiss parliament to operate 18 F-5E and four F-5F models until 2018. This would also include the continued operation of the Patrouille Suisse on F-5E until 2018. The F-5N are ex-Swiss Air Force F-5Es used by the U.S. Navy as "aggressor" aircraft, with AN/APG-69 replacing the original AN/APQ-159. Intended to replace high-time USN/USMC F-5Es in the adversary role, and see service through to 2015 (which I guess means they have been retired). Most if not all Swiss F-5Es were upgraded with a new 'shark nose' and larger LEREXs to improve low speed handling. 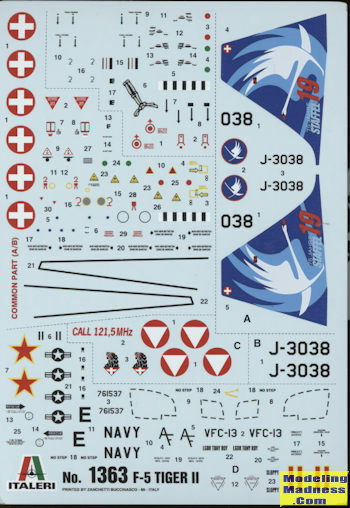 This particular kit will look very familiar to most modelers out there. This is exactly the same kit as Italeri has been producing for the last 30 plus years. However, the fuselage on this one has been slightly reworked to include the larger LEREX and the shark nose. The kit still has raised panel lines. It also may have had the interior slightly improved with instrument faces on the main panel and side consoles. I do not have an older kit against which I can make comparisons, though they are easy enough to find. Testors re-boxed both the E and F versions back in the 80s and they seem to be fairly plentiful. I actually like that Italeri kept the raised lines as it would have been weird to do otherwise. The nose is molded on each half and protected by a semi-circular sprue. In line with the earlier kit, the wings are molded with the upper fuselage half and holes for the pylons are already drilled. Means for you aggressor types that you'll have to fill them. Cockpit is basic but adequate. I do not know who might make a resin one, butfor most of us it isn't required. The ejection seat is a right and left side with no belt detail. This would benefit from a resin replacement. 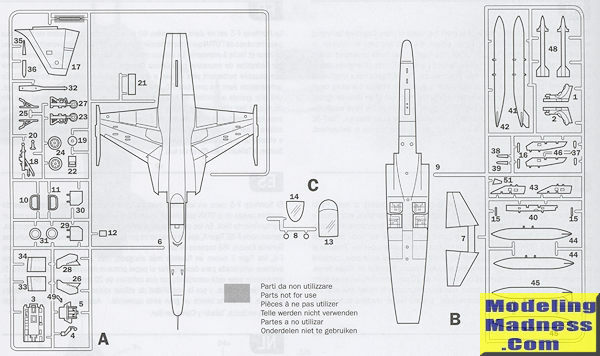 The tailplane is trapped between the upper and lower fuselage halves. Instructions show 10 grams of weight needed, bu this seems excessive. The intakes are a single piece and quite shallow. Swiss F-5s has RHAW antennas on the back of the fuslage. The kit also has a shark fin antenna included. One can pose the canopy open, but it is held up by a simple plastic L and not the rather complex looking F-5 hinge mechanism. Landing gear are nicely done in gear wells that seems a tad shallow. You can pose the speed brakes open, but there is no actuating mechanism. Due to the way the inner gear doors are molded, you cannot do an in-flight model without a bit of work. For things under wings we have fuel tanks for the centerline and inner wing pylons. There is nothing on the outer wing pylons and there are Sidewinder shapes for the wing tips. Again, aggressor planes will be using data probes on the wing tip stations, no wing pylons and perhaps no centerline tank. Instructions are well done with both FS 595 and Italeri acrylic paint references. Markings options are actually two Swiss planes, one with the fancy tail shown on the box art and the other a standard tail presentation. A loaned Austrian plane is included, both of these planes in two greys. The third plane is with VFC-13 in FS 36495/36375/35250 in bands over the upper surface and sides with a solid color underside. The decal sheet is nicely printed and should provide no issues. For many of us this is an old friend with a new nose and wings. I was unaware that this version had been done until a Forum member clued me in. 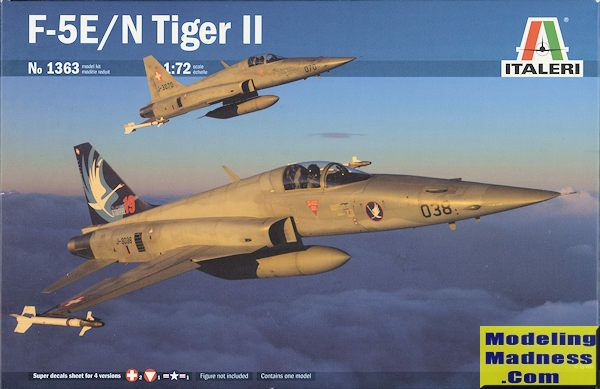 My only reason for picking this one up is a new F-5 Top Gun sheet by Furball Aero-Design. I like aggressors and wanted to duplicate one of the many options on the sheet. Though the price seems a bit excessive for such an old kit, it is cleanly molded and will make into a very nice replica when done.